Description: Super Mario RPG was one of the greatest JRPG's available on the Super Nintendo. It was a pleasant surprise back in 1996 to see Square create this game for Nintendo. While the Square team worked on the game they were under direct supervision of Mario's creator and founder Shigeru Miyamoto, to ensure this game would live up to the Mario name, and it did. The story is basically the Mushroom Kingdomis under attack by the Smithy gang. 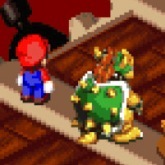 Even Bowser has lost his troops, and joined forces with Mario and friends to save the world. The gameplay is traditional turn based style, with useful items and leveling up. If you plan on playing this all the way through, it will take 16 hours or more to complete, so be sure to use save states when ever you can.